and press the START button to begin the filling process. 275 psi and the Refueler 60 turns itself off without operator attention. morning with full natural gas supplies. fill at a rate of one cubic foot per minute. and regulations for cylinder filling. The system includes a flexible 5’ hose for connection to a 3/4” low pressure gas pipe and a shutoff valve. 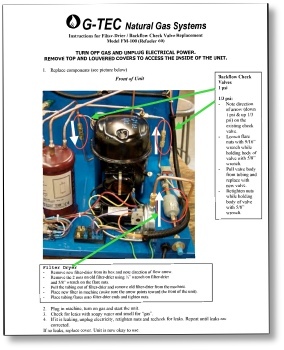 Refueler 60 should be located indoors in an area where temperatures range between 40F to 90F/22C to 32C. 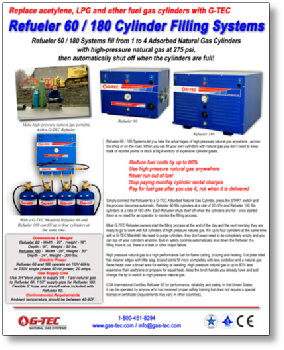 How to install a Refueler 60 Cylinder Filling System. special license or certificate. Requirements to operate Refueler 60 may be different in other countries. 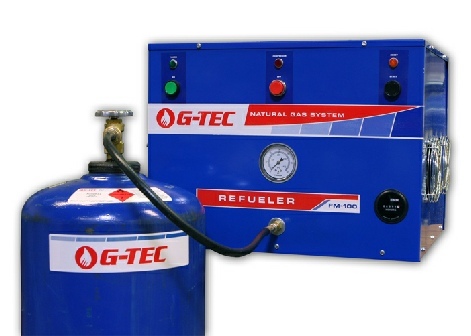 Refueler 60 is CE Compliant for use in European Union countries.